Radio Ballad No 5 - Parker, MacColl, Seeger, etc. This recording describes five people's experiences of poliomyelitis, from the initial contraction through physical, emotional and psychological trauma to eventual degrees of stability and acceptance. This journey is presented using narrative sequence and song. The narrative sequences, recorded by Charles Parker within the space of a fortnight, were extracted from interviews with these five people, three of whom were now living at home and the other two in the hospital where all five were initially treated. Much was made in the accompanying booklet of the 'montage block' recording technique employed, ie; cross-cuts between speakers without the use of fades or cross-fades, this being an innovative presentation at the time. This blocking technique was inspired by Alain Resnais' film Last Year in Marienbad and, according to Ewan MacColl, this lent the narrative a 'stream-of-consciousness' quality, as in James Joyce's Ulysses. I listened with bated breath! 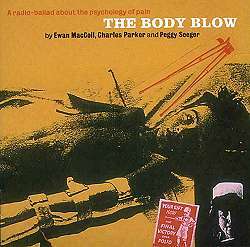 Interspersing these narrative sequences were songs, written by MacColl, orchestrated and directed by Peggy Seeger. Rationale for this sequencing was given by MacColl, describing the songs as compass-bearings. Clearly, after several listenings, the songs appear to pull together some of the strands and themes expressed by the interviewees. Some process analysis [Bodley, 1992] techniques, however, exposed loose interpretation and assumed extension of experience from narrative to song. This disturbing element was to be found throughout the CD - an example is from track 5. The narrative expresses uselessness, despair ("if I was a dog they would put me down"), loss (of control), resentment (of condition) and some ironic humour, the corresponding song lyrics express bewilderment (why should this happen to me? ), disability (weak and crippled, wheeled in a chair) and resentment (to stagnate and rot). The despair element does not come through, except in musical suggestion and the humour ignored completely. Considering the significance of despair within a grieving process [Bowlby, 1981 & 1984; Kubler-Ross, 1973; Leick & Davidsen-Neilsen, 1987, Lendrum & Syme, 1992], I find this omission surprising. The extension of communicated expression from the narrative to the song lyric is at times a leap of faith - at no point do the interviewees liken themselves or their condition to the infant state expressed in both tracks 5 & 6 song lyrics. There is one comparison to the 'semi-idiot child' state, expressed by an interviewee, but this is very much to do with inter- rather than the intra-personal expression in the songs (rocked like a babe in a cot, safe as a babe in a cradle of steel). The interviewee reflects upon an incidence of inter-personal communication between a nurse, ("come along now dear, open up"), critical/nurturing parent stance [Stewart & Joines, 1987] in response to the interviewee ("for goodness sake, you are cleaning my teeth not scrubbing the doorstep"), child stance. The reflection is that the nurse was talking to her as if to a semi-idiot child. Although both are clearly referring to the helplessness encountered with disability, the song lyrics miss the point that it is not the state itself but the interpretation of that state within a communication process that compounds the helplessness. This in itself is ably demonstrated within the narrative, as a motivator to relearning skills, and finding new ways of coping for some. Yet again the song element as 'compass bearing' sends us a little off course - attributing this motivation to 'the human way' and the 'human spirit'. What does that then say of those who chose a different way, (suicide, passive withdrawal) - are they any less human or brave? I find this 'one way for all' idea not only naïve but dangerous in that the expectation denies individuality. At this point it is tempting to wonder, were the songs inspired by listening to the entire interview transcripts or were extracts from the interviews selected to fit in with the songs? After many listenings I began to find the song element as irritating as I found the narratives fascinating. The song style is identifiably dated within the 1950s / '60s revival era as one would expect. Despite making allowances for this, references to the 'human will' (track 12), being stronger than pain, 'one world, one cause' and 'the human way' all leave me wriggling in my seat with the embarrassing suspicion of false sentimentality. The narrative sequences, however give glimpses of human experience, told with the misleadingly flat delivery and understated emotional content so often found within English culture - and this contrasted sharply and poorly with the song style. Perhaps it is my own 'Englishness' which draws me to the honesty of the real experience expressed by the interviewees. In conclusion then, a worthy effort in its time, and of value now for its place within the move towards a more public understanding of disease and disability. I found the title 'a psychology of pain' misleading, perhaps 'some expressions of pain' would have been more accurate. The songs I found to be over - and perhaps erroneously - interpretive of the narratives, and as such a beckoning doorway to the 'does he take sugar' syndrome. Rather than being the reliable compass bearings MacColl intended, I found them to be the fog that obscured navigation. In all then, pretty grim listening. I think that I would rather have listened to the entire interviews without any interference ... and I really can't help wondering where Norma Smith, Heather Ruffle, Paul Bates, Duchy Holland and Jean Hagger are now and what they thought of the radio ballad. Bowlby, J. 1981 - Attachment & Loss - Vol 3: Loss, Sadness & Depression. Penguin Books, London. Bowlby, J. 1984 - Attachment & Loss - Vol 1: Attachment. Penguin Books, London. Kubler-Ross, E. 1973 - On Death & Dying, 2nd Ed. Simon & Schuster, New York. Leick, N & Davidsen-Nielsen, 1987 - Healing Pain - attachment, loss & grief therapy. Tavistock Routledge, London. Lendrum, S & Syme,G. 1992 - Gift of Tears - a practical approach to Loss and Bereavement Counseling. Routledge, London. Stewart, I & Joines,V. 1987 - T A Today - A New Introduction to Transactional Analysis. Lifespace Publishing, Nottingham.